This article provides instructions to configure and register MediaVue SureVue devices with Appspace App. Currently, the Appspace client software for MediaVue SureVue comes preinstalled on the device. Click the Appspace tab on the MediaVue SureVue console, and enter in the credentials and the URL for your Appspace server. Appspace Cloud: Login to your Appspace cloud account, go to System > Downloads via the Appspace menu, and copy the device registration link displayed there. 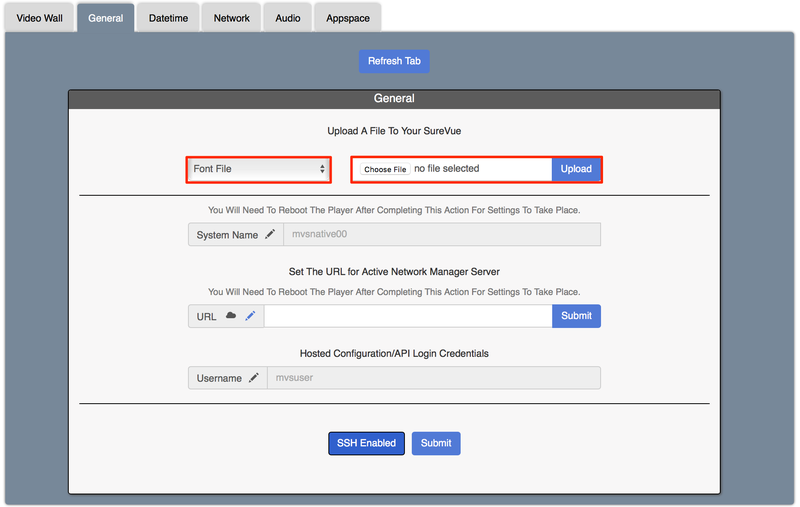 Appspace On-Premises: Use the Appspace on-premises server URL. Example: http://appspace-server-URL or https://appspace-server-URL (if using SSL). Click the Connect To Server button. Once successfully connected, click the Start Appspace button to launch the Appspace App. The MediaVue SureVue device supports multicast streams if H.264 codecs are used. 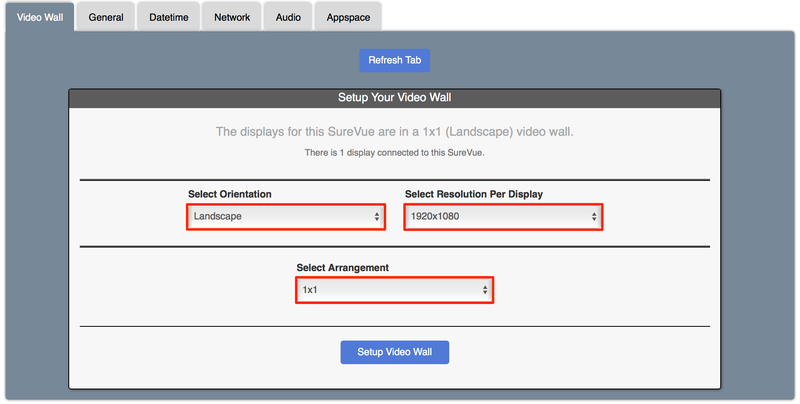 Login to the MediaVue SureVue device, and click the Video Wall tab. Select the video wall orientation and resolution. Select the video wall arrangement depending on your device and video wall setup. Click the Setup Video Wall button. Click the Audio tab, and select Built-in Audio Digital Stereo (HDMI) from the Audio Device menu. Click Submit Changes to save. If the channel utilizes custom fonts, click the General tab, and select ‘Font File’ from the Upload A File To Your SureVue menu. Click Choose File to browse and select a font file, and click Upload. Click the Appspace tab, and enter in the Appspace server URL and Appspace login credentials. Click Connect To Server to ensure the connection to Appspace is successful. Click Start Appspace to launch the Appspace App. If the video wall arrangement appears jumbled when set to Portrait via the MediaVue configuration interface, set the video wall Sign channel resolution to match the video wall setup. Below is a list of available hotkeys for the MediaVue SureVue device. Shift + Alt + C - Close Appspace and launch SureVue configuration interface. Please contact MediaVue for remote control support: http://mediavuesystems.com.